Shipping fees are determined by a factor of the parcel size, parcel weight, travel distance, and rate of transport. Freight on orders will be quoted based on shipping estimates. Upon acceptance of quotation, shipping charges will be invoiced precisely as quoted. Freight costs are passed along directly; there is no mark up on freight. Stadium Sportswear has a dedicated driver and vehicle in order to make deliveries direct and reliable. Deliveries within city limits will be rated at $20.00. This includes St. Albert and Sherwood Park. Spruce Grove and outlying areas are subject to delivery fees based on location and will be quoted on a job by job basis (base rate of $30.00). Orders can be picked up as an alternative to delivery, and we do offer free delivery service to our west location for pick up convenience. Google Maps will be used to determine distance to delivery destination, using Stadium north location as the departure point. Stadium offers products from offshore locations that in some cases require currency exchange rate calculation. Foreign orders requiring currency exchange will be quoted at the days current exchange rate. Invoicing will occur on the date of completion based on the exchange rate on the date of invoice. Exchange rates will be applied to freight. 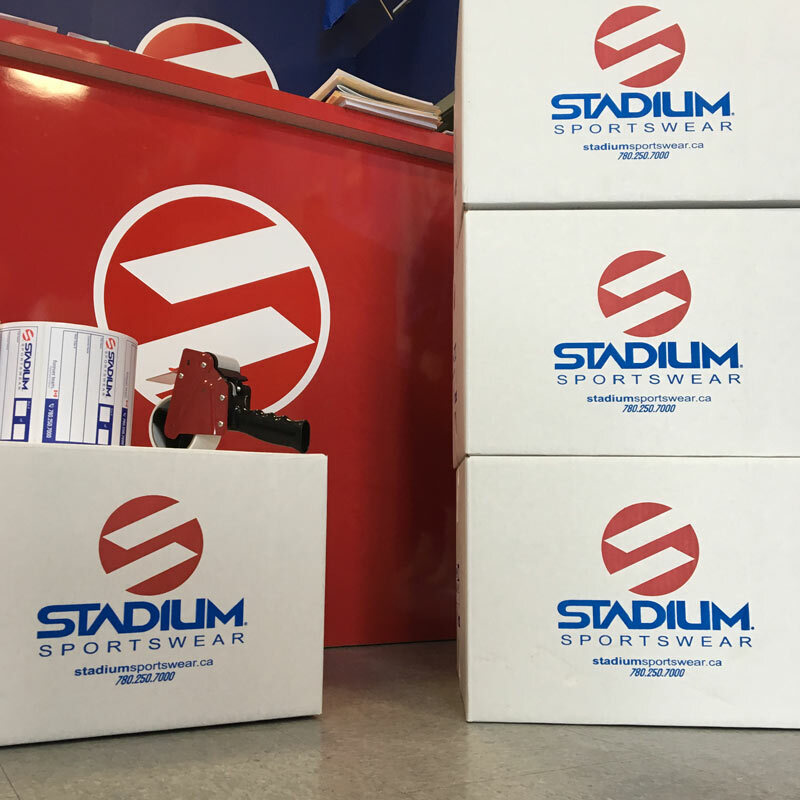 Stadium Sportswear has a dedicated broker assigned to handling all import paperwork and customs clearance documents. Rates for broker fees are passed along, and there is no mark up on broker fees. Broker fees are included in the offshore quoting process. Duty rates are levied by Canada Import Regulation. Import duties are pre-determined by national code and are included in the offshore quotation.